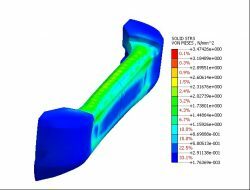 Finite element analysis can be used not only for understanding wear and reducing the cost of prototyping but also as part of a critical safety analysis prior to real-world tests. To assist a commercial vehicle manufacturer in developing a rubber bumper that would enable them to pass US legislative crash tests. A secondary challenge was to make it as lightweight a solution as possible, offering savings on running costs and downtime. The vehicle was the only one in the bidding process to pass crash tests first time. The component we designed is also x% lighter than standard, thanks to a novel lightweight core at the centre of the product. Our client specialises in low volume electric and hybrid vehicles. It is a company made up of experts from the most prestigious specialist vehicle manufacturers, who have particular expertise in light-weight solutions and electrification, providing their customers with a complete solution, from concept to launch, with skills across engineering, manufacturing and programme management. The challenge that we were asked to collaborate on focused on enhancing safety, reducing emissions and producing operational savings. 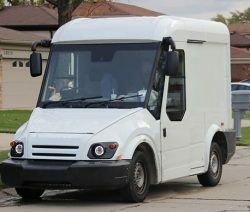 The vehicle had to go through two stages: an initial crash test, followed by an operational prototyping phase where the vehicles would be in use. 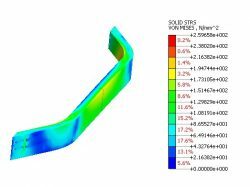 We collaborated with our customer to develop a rubber bumper to specification and then undertook finite element analysis (FEA) to demonstrate how the bumper would perform under impact forces at a given speed and over a specified crash stop distance. This enabled our client to design their aluminium chassis around the bumper geometry, providing reassurance that in the event of a crash, no damage would be caused to the metal structure. Final simulations were run with the customer-designed aluminium crash structure in place behind the proposed 12mm wall bumper. The images below demonstrated that the rubber bumper would absorb sufficient energy that the support beam would not reach the aluminium yield point, allowing the overall structure to compress but return to its designed form. Once we had finalised the geometry between us, we set to work looking for a way to reduce the weight of the product, which would allow a reduction in running costs and/or emissions, depending on which version of the vehicle was in use. The use of a honeycomb-style core encapsulated and bonded within the main frame of rubber allowed us to provide a lightweight solution, whilst still ensuring the levels of deformation and subsequent recovery on impact. The combination of weight reduction and compression requirements, alongside the overall size of the product, meant that we had a number of challenges to overcome. Our engineers worked closely with the customer’s team to ensure that the result was not only a success but was best-in-class when it came to safety, the primary objective.